The *LUNCH* is now SOLD OUT, however, we have just opened up the Tri-Valley Summit meeting (in a bigger venue) so that people can attend the TVMS (and then enjoy coffee, dessert and networking, after the meeting). 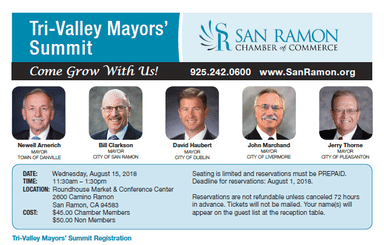 Click HERE to purchase a ticket for the Tri-Valley Mayors’ Summit, Dessert, Coffee & Networking (again, no lunch is included in this price but, you can buy lunch at one of three delicious restaurants just down the hall. Click HERE to see their menus and pricing).